Written by J. Patrick Lewis, just for my first born son, Tugg and Teeny have calm adventures involving their friends Chuckie Cheetah, Margie Barge the hippopotamus, and Violet the warthog. The reader is divided up into three separate stories, much like you would expect out of an Arnold Lobel book (i.e., Frog and Toad.) This makes the book approachable for a budding reader and a satisfying challenge for newly independent or just plain old independent reader. Bookworm1 has just begun reading the Bob Books alongside us and Tugg and Teeny are still a ways off from his current skill level. However, he adores the animals within the pages, having a particular fascination for apes at the moment. 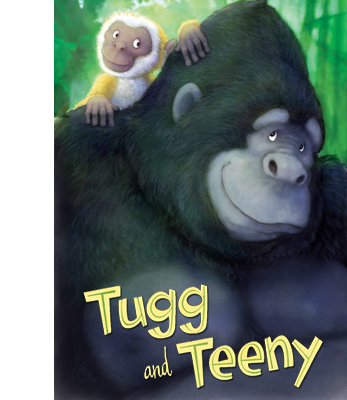 Tug and Teeny, the first book in the series, is really quite perfect. Sleeping Bear Press has two additional titles for this series in the works. In May 2011 they are poised to release Tugg and Teeny's Jungle Surprises and come September 2011 you'll be able to locate a copy of Tugg and Teeny's That's What Friends are For. In the meantime, you can browse the Tugg and Teeny Website for information on each title as well as to collect beginning reading strategies, and to download activity pages for each of the chapters in the first book, Tugg and Teeny. Per usual, Sleeping Bear Press is putting their best foot forward with these titles and these characters are already loved and appreciated in this household. Would you like to introduce them to your own children? Well then, you'll be delighted to know that Sleeping Bear Press has generously offered up THREE copies of Tugg and Teeny for three readers here at Reading to Know. To win? Simply leave a comment below. This contest will be open through Tuesday, March 15th and is open to U.S. Residents only. THIS GIVEAWAY IS NOW CLOSED. THE WINNERS (as selected by Random.org) ARE #5 - Alicia, #22 - Apple Blossom and #24 - Nancye. CONGRATULATIONS LADIES! Thank you, Sleeping Bear Press, for sending us a copy of Tugg and Teeny to check out and for offering up three additional copies for readers here. These sound like they would be right up my daughter's alley...and possibly get my younger son interested in a chapter book, too! The illustrations really look awesome...as does the story line. oh my gosh Sprite would love this book! I would love this book! I bet my daughter would love these, being an animal love and all! These sound adorable! My 5 yr old daughter is just in love with animals of all kinds. I love the art! My girls would enjoy this, I'm sure! Thank you for the giveaway! How fun! I think my nephews would enjoy this book. They look adorable! I love that there are so many books for beginning readers. These look like lots of fun, Carrie! I just started a reading program with Ian this week - perfect timing for a new reading book! Hope I win! These look so great! I hope I win! Thank you for the chance. Fun! Cory hasn't really started reading yet, but I know we could use these in the not too distant future! I want!! How cute this book looks! Very cute! My 4 yr old who thinks he's a monkey would adore these. This looks like a really cute book. I'd love to win this for my DIL's niece. These look really cute! And you know our love of Sleeping Bear Press!! What a sweet book! I would love, love, love to win this book for my daughter! Thank for the chance. I love Sleeping Bear Press, and I'm excited to see that they are getting into the Beginning Reader market! Good things ahead! I'm a fan of Christopher Denise as well -- "Tugg & Teeny" looks super.